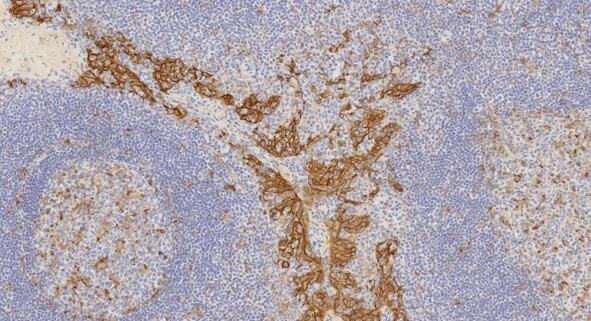 PD-L1 Antibody Panel ab239749 is a panel of 4 recombinant rabbit monoclonal antibodies against human PD-L1. They are provided in small sizes to allow you to easily evaluate which is the best PD-L1 antibody for your human PD-L1 research assay needs. See our comparison table of PD-L1 clones 28-8, 73-10, SP142 and CAL10 to help you find the optimal recombinant monoclonal PD-L1 antibody clone for your research. 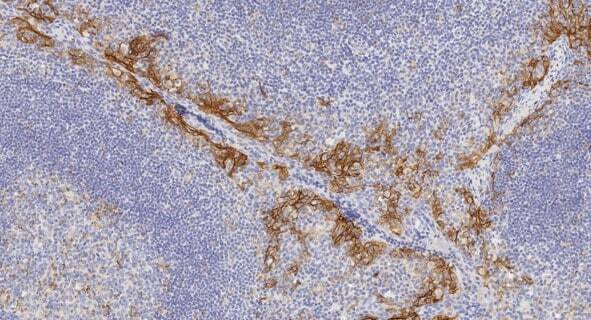 All of the antibodies are ideal for use with immunohistochemistry with paraffin-embedded / formalin-fixed sections (as well as with other techniques). 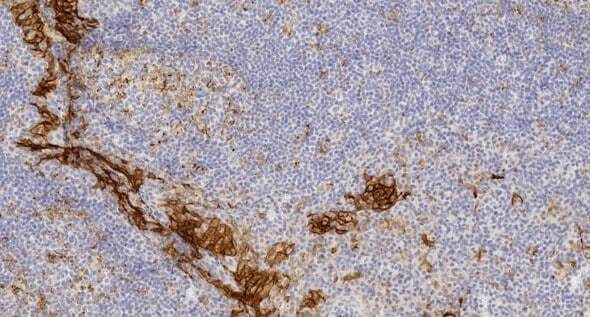 IHC image of ab228462 staining PD-L1 in human tonsil formalin fixed paraffin embedded tissue sections*, performed on a Leica BOND RX (standard Protocol F, Polymer Refine kit). The section was pre-treated using heat mediated antigen retrieval with EDTA buffer (pH9, epitope retrieval solution 2) for 30 mins at 98°C. The section was then incubated with ab228462, 1/400 working dilution, for 15 mins at room temperature and detected using an HRP conjugated compact polymer system for 8 minutes at room temperature. DAB was used as the chromogen for 10 minutes at room temperature. The section was then counterstained with hematoxylin, blued, dehydrated, cleared and mounted with DPX. 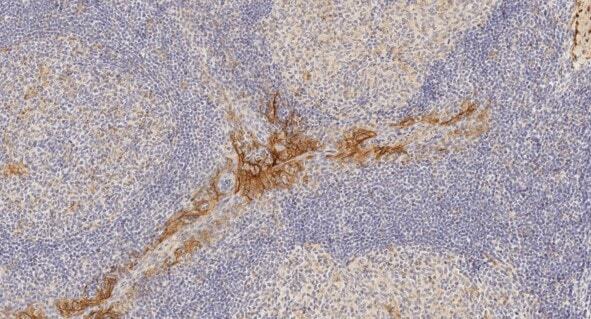 IHC image of ab237726 staining PD-L1 in human tonsil formalin fixed paraffin embedded tissue sections*, performed on a Leica BOND RX (standard Protocol F, Polymer Refine kit). The section was pre-treated using heat mediated antigen retrieval with sodium citrate buffer (pH6, epitope retrieval solution 1) for 30 mins at 98°C. The section was then incubated with ab237726, 1μg/ml working concentration, for 15 mins at room temperature and detected using an HRP conjugated compact polymer system for 8 minutes at room temperature. DAB was used as the chromogen for 10 minutes at room temperature. The section was then counterstained with hematoxylin, blued, dehydrated, cleared and mounted with DPX. ab239749 has not yet been referenced specifically in any publications. Publishing research using ab239749? Please let us know so that we can cite the reference in this datasheet. There are currently no Customer reviews or Questions for ab239749.